If you are a longtime follower, you may remember a post from several years ago on short suits? I LOVE THEM! I still have the one I talked about in that post long ago, but I recently came across another style I knew I had to have. 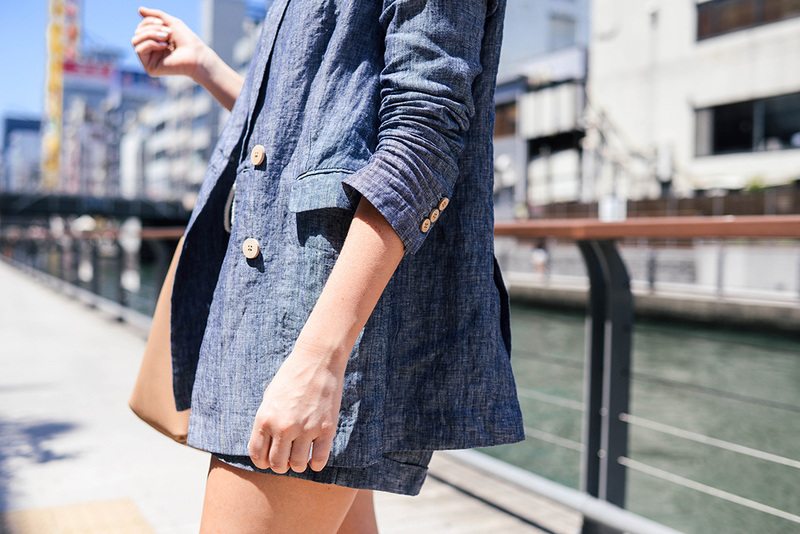 This linen blazer and matching short set were perfect for spring in Japan! I love how comfortable and effortless this look is while also having that chic, city-girl feel to it. The best part? You can wear them together or style them separately and get an incredible amount of use out of each piece. For this look wandering around the Dotonbori area of Osaka, I chose a linen v-neck tee and espadrille sneakers for a cool, casual outfit. The linen is super lightweight, so ideal for warmer days this spring/summer! Also, the rope belt detail on the shorts adds interest and a stylish touch. The shorts are slightly high-waisted and the hem is pretty long, which I really appreciate. Shorts can be so, so short these days! I’m wearing a medium in the shorts and a small in the blazer, FYI. Anyway, MANGO has so many great linen items like this for spring/summer. I don’t shop there very often, but when it’s good, it’s reeeeal good. Check out more of my favorites below! The striped linen dress I bought now comes in blue, and I’m super tempted to pick it up too! This little short-sleeved safari jacket is the perfect soft neutral to wear with white jeans, don’t you think? Love all the pockets! Y’all know how much I love a trench right? Thinking I need this one next. Add some color to your spring/summer wardrobe with this embroidered jacket. These linen shorts come in three colors and with a pretty bow belt for the perfect paper bag waist! Loving these easy linen pants too for lounging and errands this summer. So chic! Love Mango and I love this short suit! It is so chic! Such a cute combo! Love that you and Jess both wore short suits on your trip! I enjoy a good pair of linen pants, so of course, these shorts are nice. Great ensemble!